Prep your wardrobe for the warm, sunny days ahead adding a fab touch through eye-popping shades of red, blue and silver! Check out the newest Bershka June 2012 Lookbook and get inspired! Are you ready to have fun this season? Show off your fashion credentials and put together statement-making combos for maximum impact! Try super-cool pieces available online and in stores and be the belle in the sun! If you lack inspiration, have a nosey at the latest Bershka June 2012 Lookbook and find some great ideas to refresh your warm-weather outfits. Check them out and update your closet! As usual, the famous Spanish brand brings a wearable and affordable range of goodies for fashionistas who like to play dress up. Red, blue and silver. 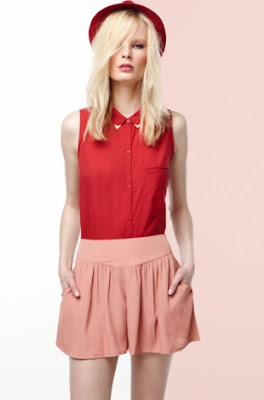 These are the three colors that Bershka uses in order to create oh-so-fab ensembles. Trust us, you'll irremediably fall in love with the simplicity yet incredible awesomeness of these beauties. So, it's time to think eye-popping red for wow-worthy appearances. Wear your red skinny jeans with a sheer blouse and a boyfriend blazer. Or, add a tomboy twist to your girly summery look choosing a red hat. Pretty cool, isn't it? Are you thinking blue this summer? No, neon blue to be more precisely! At least, this is what Bershka proposes for the beautiful sunny days ahead. Used for cardigans, tops, pants, dresses or shoes, this color will instantly brighten up your overall look. If you're obsessing with attention-grabbing stunners, you should definitely consider silver as seen in the Spanish brand's collection. Take a sneak peek at Bershka's versatile, uber-comfy and effortlessly hip offerings and give attitude to your dressing! You'll certainly turn heads!